The Samsung phablet does not get Lollipop yet, but a new KitKat update that comes with improvements and fixes, as well as a few preloaded apps, including Find My Mobile and Kids Mode stub in Widget Tray. 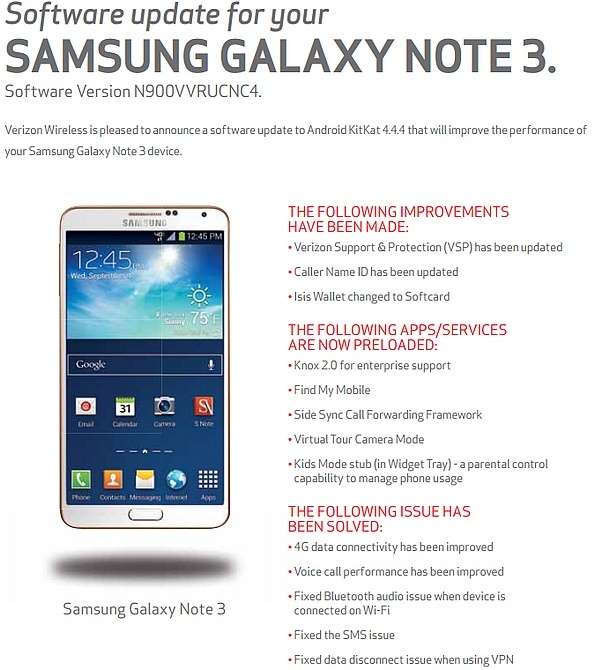 Next to Verizon's customers that use Galaxy S4 handsets, the carrier's clients who own the Galaxy Note 3 phablet are waiting for the Android 5.0 Lollipop update to become available for their devices. Unfortunately, that is not the case for now since all they get is Android 4.4.4 KitKat. The good part is that this update brings even a few new features next to the usual fixes and improvements. 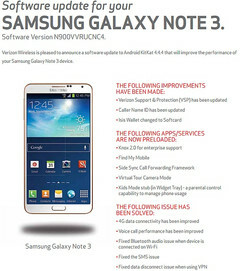 In addition to the above, the new Android update for Verizon's Samsung Galaxy Note 3 phablets improves 4G data connectivity and voice call performance, also fixing SMS and Bluetooth problems, as well as the data disconnect issue that appeared when using VPN. The update is already rolling over-the-air, but users who did not get an OTA notification yet can also perform the operation manually.